Peridot is the gem variety of the mineral chrysolite or olivine. It is a silicate of iron and magnesium found in basaltic igneous rocks. Although the mineral is fairly common, gem quality specimens are rare. Peridot is what is termed idiochromatic, meaning that the elements causing its color are essential in its composition. The color of peridot varies only slightly as the result of the relative percentages of iron and magnesium. The finest stones will be the richest green. The Egyptians fashioned and wore peridot beads 3500 years ago! The source of this peridot was the island of Zabargad in the western region of the Red Sea, opposite the Egyptian port city of Berenice. Peridot was known in ancient times as the "gem of the sun" and believed its powers to dissolve enchantment and banish evil thoughts. To exert its full powers, it had to be set in gold. Then it was guaranteed to chase away terrors of the night and protect against all evil spirits. 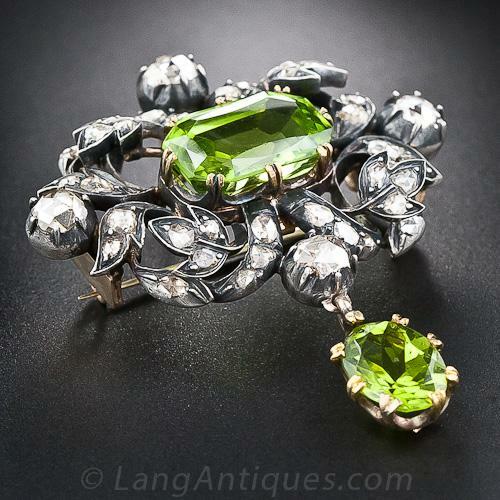 Turkish Sultans amassed the largest collection of peridot during the Ottoman Empire. There are hundreds of peridots on display at the Topkapi Museum in Istanbul. It was a popular gemstone in Victorian jewelry. Peridot is the birthstone for August and commemorates the 16th anniversary. Peridot is associated with the heart chakra, and it fosters harmony in relationships of all kinds, but particularly marriage. It is a gem of wealth and abundance. Peridot can assist in childbirth and rebirth. Crystal mystics still believe in its ability to make a protective shield around its wearer. Medicinally, peridot has been attributed with helping in problems with digestion and ulcers.